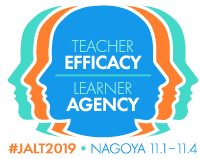 Every year, our JALT Conference brings together language teaching professionals from around the world. The JALT Postconference Publications are annual volumes produced by the Conference Publications Committee of the Japan Association for Language Teaching. They stand as a record of our conferences—what was presented and what was subsequently achieved. All JALT Postconference Publication articles are subject to a stringent process of review by at least two members of our Editorial Advisory Board. Manuscripts deemed suitable for possible inclusion in the Postconference Publication then go through a careful process of editing and proofing before being considered for final publication.